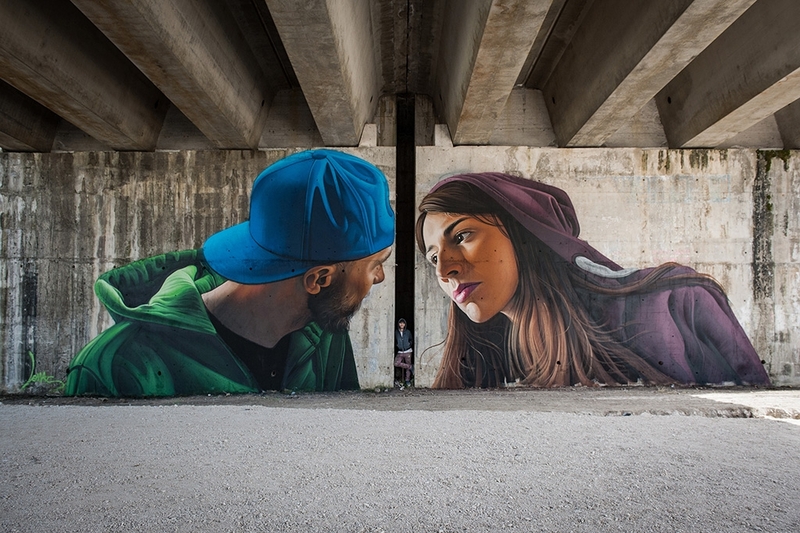 Lonac is a Croatian artist that earned recognition with his masterful spray paint technique and photo realistic murals. As a schooled painter, he is strongly influenced by classic art, which is noticeable in his work. From creating a reference photograph, prepping the wall, to adding the finest final details, he approaches every piece with absolute dedication and devotion. Meticulous in execution and very harmonious in their composition, his murals are almost exclusively done with spray paint. Often based on his personal memories or observations, they are influenced by skateboarding culture, comics, graffiti, movies, music, as well as social issues. Along with dominating realist imagery, his works often features surrealist, often recurring elements. Constantly on a quest to improve his already impressive technique, he keeps pushing himself with more demanding images and unusual concepts. Though known in the region and internationally, Lonac still enjoys working on his own independent, and often illegal projects, keeping the spirit of the true street artist alive. Living and working in Zagreb, he has done a lot of pieces around his hometown, but also, he worked in UK, Italy, Bosnia and Herzegovina, Switzerland.